Violent Monkey is a Romanian-English underground band, the vocal being an expat that gave UK for Romania. 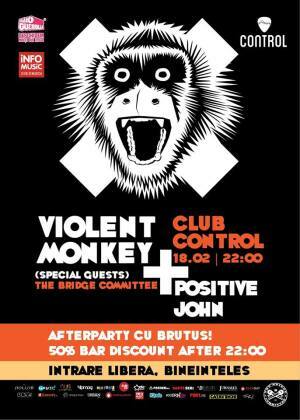 Their music gender is blending garage rock with funk and motown and, for this gig in Control Club will have as opening act a fresh new band from Cluj; Positive John and also special guests, a hip hop project half American, half Romanian - The Bridge Committee. "Violent Monkey live!" Concert in Bucharest. You can get here description, reviews, address, time and details of "Violent Monkey live!" Concert in Bucharest. Visit Bucharest Tips for more Concert events in Bucharest!